A fade resistant coating that won’t chip or peel. CLASSIC COAT uses advanced technology to provide superior adhesion and flexibility when changing or restoring the color of most leather and vinyl. A fade resistant and flexible coating that's not a dye, but a permanent paint coating. Formulated to match, restore or change color on most vinyl, carpet, velour, flexible and rigid plastic surfaces. 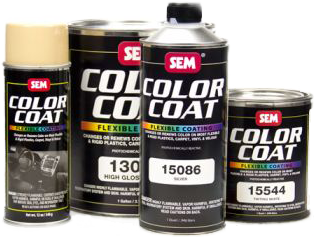 A modified version of COLOR COAT which features increased UV inhibitors to withstand the harsh environment boat seats are subjected to.